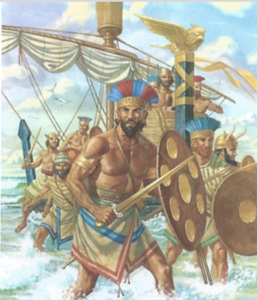 The mysterious Sea Peoples were said to have invaded the ancient kingdoms of the Eastern Mediterranean around the late 12th Century BC. Their attacks seriously disrupted the reign of Ramses III of Egypt and their invasions in the Levant are said to have led to the collapse of the Hittite Empire of Asia Minor and the end of the Bronze Age. Their origins are obscure and they may later have settled as Philistines. Dr. Bourke will present an archaeologist’s view of who the Sea Peoples were, what they looked like, where they came from, what they brought with them by way of culture, ships and weaponry. He will offer evidence of what the Egyptian and cuneiform sources tell us about their activities and the prehistory of their descent.